So you’re wondering… what is the best day to apply for a job? 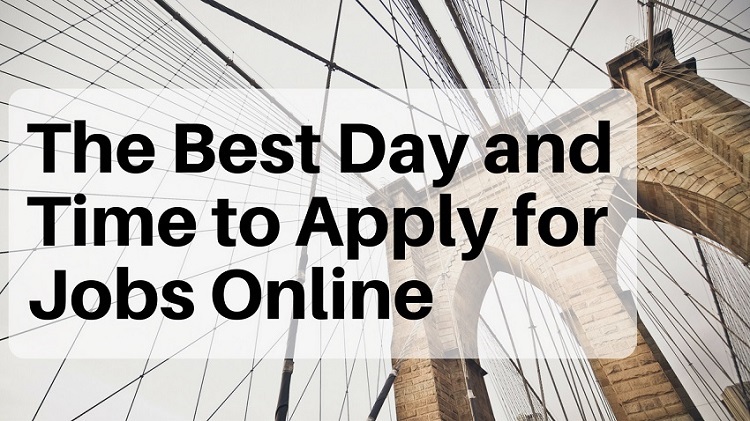 What about the best time to apply for a jobs online during the day? For the best time to apply for jobs online we suggest either the evening (after normal business hours) or the early morning. That way your application will catch the HR person or recruiter in the morning when they have less going on. Whereas if you send your email at 4PM or 5PM as they’re getting ready to leave, there’s a good chance they’ll put it off and possibly forget about it. Or that they’ll be too busy to look. So the best time to apply for jobs: Early morning or evening after work. Avoid the afternoon. Okay, we know what time to apply, but what’s the best day to apply for jobs? Well, a study by the job matching site Bright.com says it’s Monday (they’ve been acquired by LinkedIn now). The in-depth study found that 30% of candidates who applied on Mondays received an interview. That might not sound like much, but it’s the highest out of any day of the week. So Monday is your best option for applying online. If you are applying on Monday, your best bet is to send your application in the early morning so it’s the first thing on top of the recruiter’s desk. If mornings are tough for you, send it late Sunday night. Either way it will be one of the first things they read. If you can’t apply on Monday, the next best day to apply for jobs is Tuesday. In fact a few websites like Time.com and Business Insider think Tuesday could be better than Monday. Time.com found that companies post the most jobs on Tuesday and mentioned it as one of their reasons. You can check out the two links above if you want to see what other reasons they gave. But in my opinion, it takes time to read job postings, tailor your resume, and get the application ready. So even if the most jobs are posted on Tuesday, we still think Monday is best when it comes to actually hitting the “submit” button and sending in your resume. Otherwise you’re looking at Tuesday night or Wednesday (after finding the job postings Tuesday). In case you’re wondering, the worst day in the Bright.com study was Saturday. Only 14% of candidates who applied on Saturdays ever received an interview. In the end, stick with Monday or Tuesday and you’ll be fine. Our research, and a lot of other websites all seem to point to these two days as the best when applying online. If you have interviews coming up and don’t want to leave anything to chance, I’ve created a new guide where you can copy my exact step-by-step method for getting job offers. You can get more details here.